Click here to download chapter 20 work files. Note: The best practice for naming objects, buttons, and movie clips in Flash is to start with a lowercase letter, and capitalize all new words. Button names should end with "btn". Movie Clip names should end with "mc." Ending with these suffixes allows the Flash ActionScript editor to auto-complete your code and makes it easier for others to understand your intentions. Note: The hit area of the letter O is one example of how users are different from readers. For a reader, the letter O is defined by a thin, circular line surrounding an oval of negative space. A reader ignores the negative space when reading the letter O, concentrating on the contour of the letter. A user clicks on the negative space. Although the outline defines the letter, the negative space has more mass. The user sees the O as being a filled-in circle, rather than an empty circle. 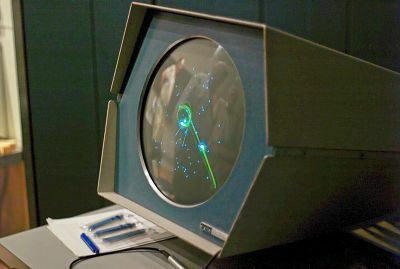 When designing interactive media the artist should consider how the user, not the reader, behaves with media elements. 4. 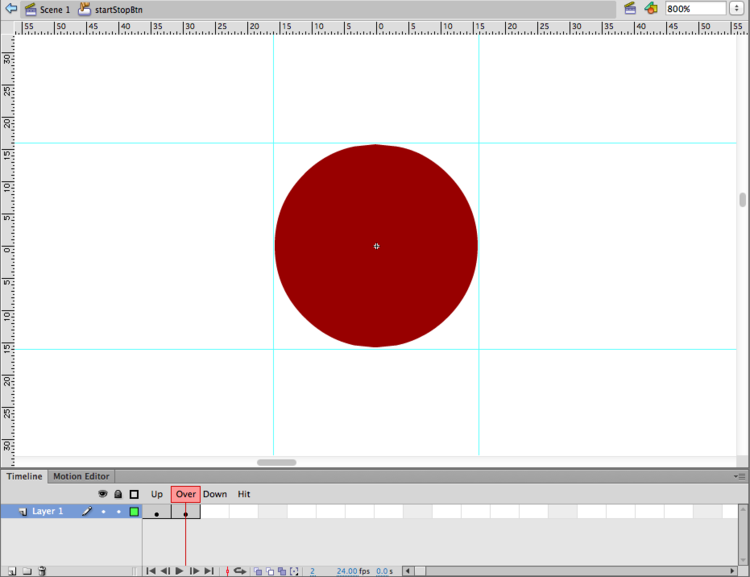 With the Playhead in the Up state, draw a red circle with the Oval tool in the middle of the Symbol Editor Stage. 5. 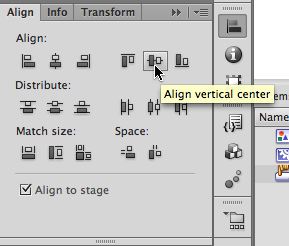 Open the Align panel from Window > Align. 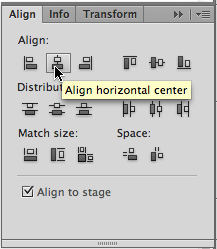 Click the “To Stage” button, then center align your button vertically and horizontally. 8. Insert a keyframe (F6) in the Down frame. Do not modify the shape. Our button will visually respond when the user mouses over it. It will not respond visually to mouse clicking because we are not changing this frame. 9. 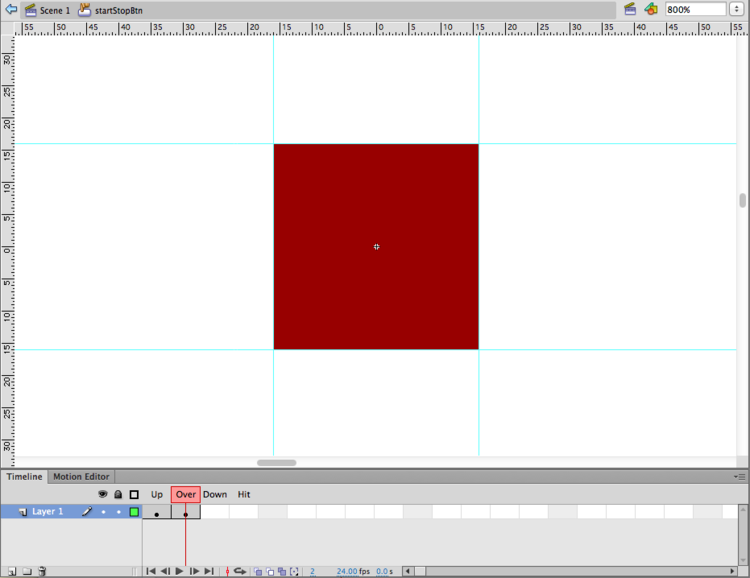 Insert another keyframe in the Hit frame. This defines the clickable area of the button. 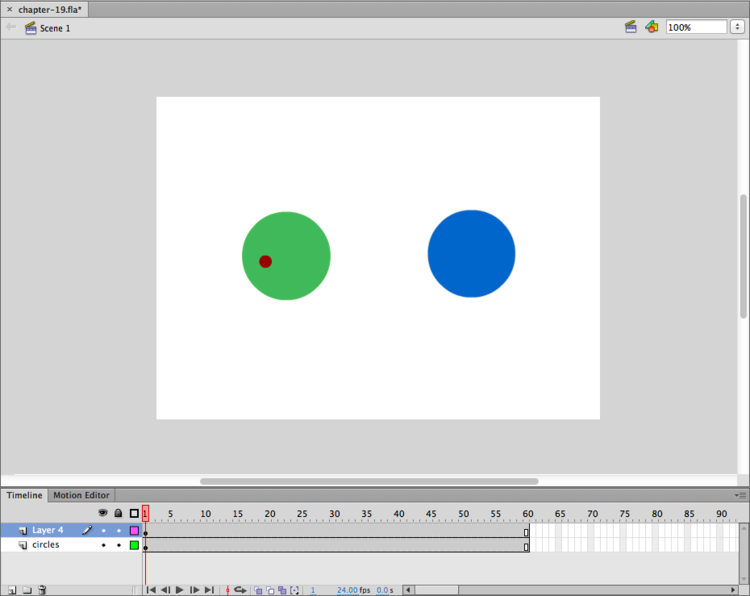 Set the Hit state to the same circle as you have in the Up button state by deleting the square (which was a result of adding a keyframe), then copying the red circle from the Up frame and using Edit > Paste in Place on the Hit frame (Command+Shift+V). 3. 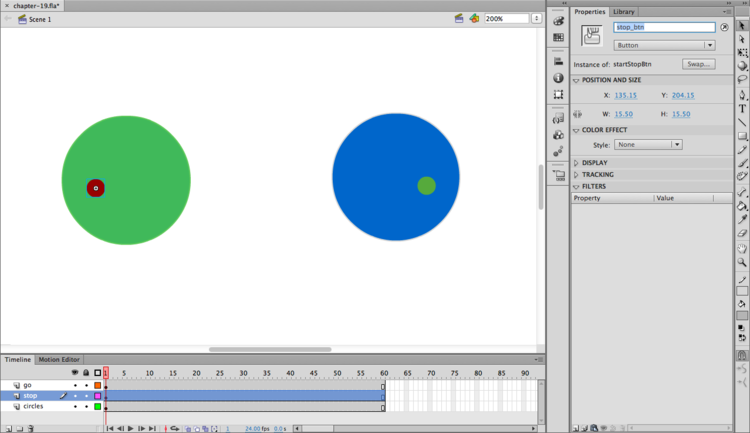 Test the animation (Command+Return). 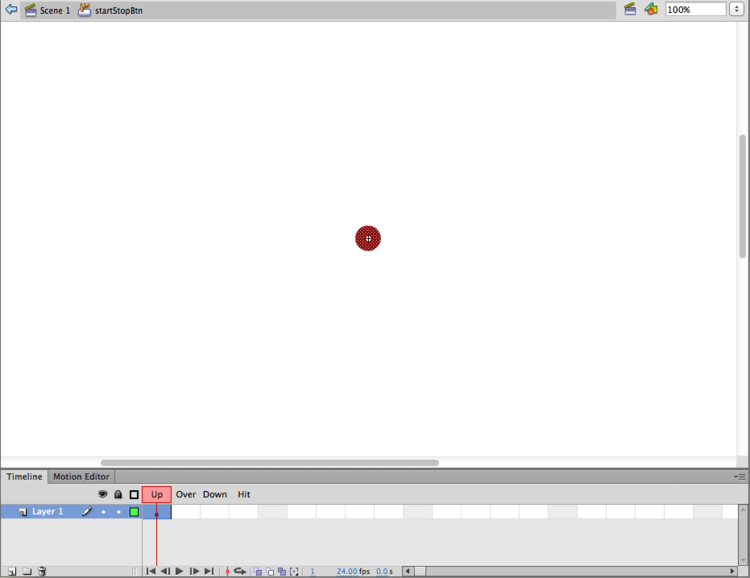 Move your mouse over the button and watch the button as it responds to your mouse interactivity. You should see the circle morph into another shape. 4. Create a new layer named go in the timeline. Since buttons are symbols, you can add multiple instances of the button to the stage. Add another instance of the button in frame 1 of the go layer on the right side of the Stage. Use the Color Effect tint style in the Properties panel to change the color of the button to green. The tint effect changes the color of all of the button states. 1. Create a new layer called actions in the Timeline. This is where the code that controls the buttons will be stored. It is best to make a seperate layer for the ActionScript code so that you (and any collaborators) are easily able to find and modify the code. 2. Select the first frame of the actions layer and open the Actions panel from Window > Actions. 3. Copy the following code into the Actions window. This code will make the Timeline stop and start when you click on the button instance labeled stop_btn. Note: Notice the words “event handlers” in the first line of the code. In programming, event handlers are common subroutines which essentially handle inputs. An input is considered something like a key press or mouse movement. There are two ways of working with code when you are not the original author. This is a common situation, and you will find both ways of working to be useful at different times. You can either try to understand every word that is written in a given piece of code; or you can treat the code like a black box, ignoring everything besides the input and output. In the black box metaphor, all you need to know is that if you modify a certain part of the code, the results will change. In this exercise, we work with the code from Exercise 3 in both ways. Before we chart how the code works, notice some of the formatting principles at work. Some of this is functional, and some of it is for legibility, but you should follow all of these formatting rules. 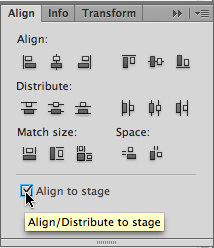 Capitalization is not just a style preference in ActionScript3.0, it actually affects functionality. 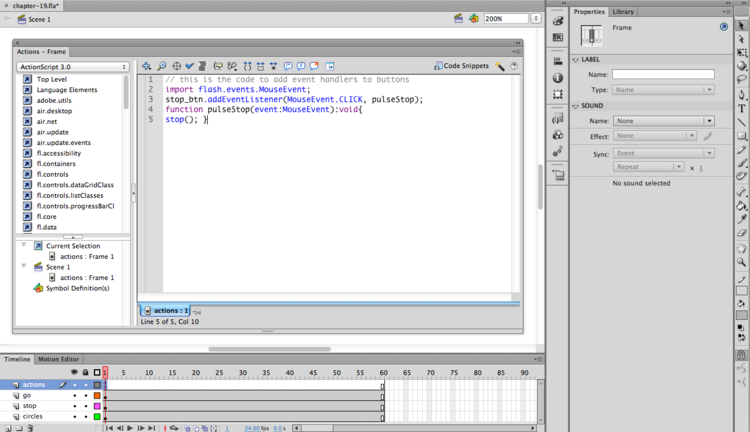 Only the properly capitalized code (flash.events.MouseEvent) will work. The other text will produce an error. This code adds an event listener to listen for click events. This event listener is defined in the code we imported in the line above. An event listener waits for an event to happen before allowing the code to respond. An event listener is a method; in programming, a method is like a verb. Methods are activities. In this example, the event listener is waiting, or listening, for a mouse click (as specified in MouseEvent.CLICK) When the event listener hears an event, it executes the function we created called pulseStop(). A function is code that defines an action and can be reused. A function can be predefined by a computer language, like stop(), or it can be created by the programmer, like pulseStop(). Every function has a set of parentheses after it; sometimes they are empty and sometimes they contain additional code. In this basic introduction, it is not necessary to worry about the extra code inside the parentheses. 2. Notice the following modifications in this new code: a. The name of the button referred to as “stop_btn” has been changed to “start_btn.” b. The name of the function was “pulseStop”. Now we are calling it “pulseStart” in both the location where it is called, on the first line, and the location where it is defined, on the second line. c. The contents of the function change from stop(); to play();. This page was last modified on 14 February 2013, at 12:54. This page has been accessed 21,001 times.